GNU Mailman is free software for managing mailing lists. Almost everybody who writes or uses free and open source software has encountered a mailing list. Mailing lists can be discussion-based or announcement-based, with all kinds of variations in between. Sometimes mailing lists are gatewayed to newsgroups on Usenet or similar services such as Gmane. Mailing lists typically have archives which contain the historical record of all the messages that have been posted to the mailing list. GNU Mailman has been around since the early 1990s, when John Viega wrote the first version to connect fans with the nascent Dave Matthews Band, the members of which he was friends with in college. This early version came to the attention of the Python community in the mid-'90s, when the center of the Python universe had moved from CWI, a scientific research institute in the Netherlands, to CNRI, the Corporation for National Research Initiatives in Reston, Virginia, USA. At CNRI we were running various Python-related mailing lists using Majordomo, a Perl-based mailing list manager. Of course, it just wouldn't do for the Python world to be maintaining so much Perl code. More importantly, because of its design, we found that modifying Majordomo for our purposes (such as to add minimal anti-spam measures) was too difficult. Ken Manheimer was instrumental in much of the early GNU Mailman work, and many excellent developers have contributed to Mailman since then. Today, Mark Sapiro is maintaining the stable 2.1 branch, while Barry Warsaw, the author of this chapter, concentrates on the new 3.0 version. Many of the original architectural decisions John made have lived on in the code right up until the Mailman 3 branch, and can still be seen in the stable branch. In the sections that follow, I'll describe some of the more problematic design decisions in Mailman 1 and 2, and how we've addressed them in Mailman 3. No message should ever be lost. No message should ever be delivered more than once. In Mailman 2 we re-designed the message handling system to ensure that these two principles would always be of prime importance. This part of the system has been stable for at least a decade now, and is one of the key reasons that Mailman is as ubiquitous as it is today. Despite modernizing this subsystem in Mailman 3, the design and implementation remains largely unchanged. One of the core data structures in Mailman is the email message, represented by a message object. Many of the interfaces, functions, and methods in the system take three arguments: the mailing list object, the message object, and a metadata dictionary that is used to record and communicate state while a message is processed through the system. On the face of it, an email message is a simple object. It consists of a number of colon-separated key-value pairs, called the headers, followed by an empty line which separates the headers from the message body. This textural representation should be easy to parse, generate, reason about, and manipulate, but in fact it quickly gets quite complicated. There are countless RFCs that describe all the variations that can occur, such as handling complex data types like images, audio, and more. Email can contain ASCII English, or just about any language and character set in existence. The basic structure of an email message has been borrowed over and over again for other protocols, such as NNTP and HTTP, yet each is slightly different. Our work on Mailman has spawned several libraries just to deal with the vagaries of this format (often called "RFC822" for the founding 1982 IETF standard). The email libraries originally developed for use by GNU Mailman have found their way into the Python standard library, where development continues to make them more standards-compliant and robust. Email messages can act as containers for other types of data, as defined in the various MIME standards. A container message part can encode an image, some audio, or just about any type of binary or text data, including other container parts. In mail reader applications, these are known as attachments. Figure 10.1 shows the structure of a complex MIME message. The boxes with solid borders are the container parts, the boxes with dashed borders are Base64 encoded binary data, and the box with a dotted border is a plain text message. Container parts can also be arbitrarily nested; these are called multiparts and can in fact get quite deep. But any email message, regardless of its complexity, can be modeled as a tree with a single message object at its root. Within Mailman, we often refer to this as the message object tree, and we pass this tree around by reference to the root message object. 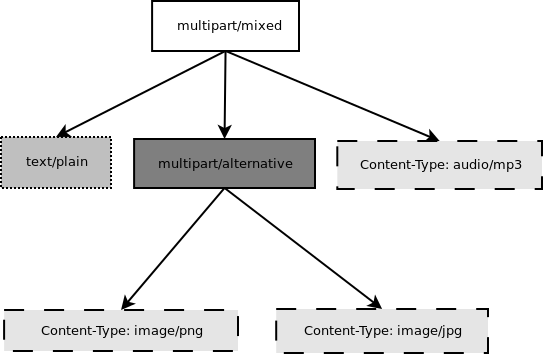 Figure 10.2 shows the object tree of the multipart message in Figure 10.1. Mailman will almost always modify the original message in some way. Sometimes the transformations can be fairly benign, such as adding or removing headers. Sometimes we'll completely change the structure of the message object tree, such as when the content filter removes certain content types like HTML, images, or other non-text parts. Mailman might even collapse "multipart/alternatives", where a message appears as both plain text and as some rich text type, or add additional parts containing information about the mailing list itself. Mailman generally parses the on the wire bytes representation of a message just once, when it first comes into the system. From then on, it deals only with the message object tree until it's ready to send it back out to the outgoing mail server. It's at that point that Mailman flattens the tree back into a bytes representation. Along the way, Mailman pickles) the message object tree for quick storage to, and reconstruction from, the file system. Pickles are a Python technology for serializing any Python object, including all its subobjects, to a byte stream, and it's perfectly suited to optimizing the handling of email message object trees. Unpickling is deserializing this byte stream back into a live object. By storing these byte streams in a file, Python programs gain low-cost persistence. Membership is defined in terms of a user or address being subscribed to a specific mailing list. Mailing lists have a large number of configuration options that are stored in the database, and which control everything from posting privileges to how messages are modified before final delivery. Mailing lists have owners and moderators which have greater permission to change aspects of the list, or to approve and reject questionable postings. Every mailing list has its own archive. Users post new messages to a specific mailing list. and so on. Almost every operation in Mailman takes a mailing list as an argument—it's that fundamental. Mailing list objects have undergone a radical redesign in Mailman 3 to make them more efficient and to expand their flexibility. One of John's earliest design decisions was how to represent a mailing list object inside the system. For this central data type, he chose a Python class with multiple base classes, each of which implements a small part of the mailing list's responsibility. These cooperating base classes, called mixin classes, were a clever way to organize the code so that it was easy to add entirely new functionality. By grafting on a new mixin base class, the core MailList class could easily accommodate something new and cool. For example, to add an auto-responder to Mailman 2, a mixin class was created that held the data specific to that feature. The data would get automatically initialized when a new mailing list was created. The mixin class also provided the methods necessary to support the auto-responder feature. This structure was even more useful when it came to the design of the mailing MailList object's persistence. Another of John's early design decisions was to use Python pickles for storing MailList state persistence. In Mailman 2, the MailList object's state is stored in a file called config.pck, which is just the pickled representation of the MailList object's dictionary. Every Python object has an attribute dictionary called __dict__. So saving a mailing list object then is simply a matter of pickling its __dict__ to a file, and loading it just involves reading the pickle from the file and reconstituting its __dict__. Thus, when a new mixin class was added to implement some new functionality, all the attributes of the mixin were automatically pickled and unpickled appropriately. The only extra work we had to do was to maintain a schema version number to automatically upgrade older mailing list objects when new attributes were added via the mixin, since the pickled representation of older MailList objects would be missing the new attributes. As convenient as this was, both the mixin architecture and pickle persistence eventually crumbled under their own weight. Site administrators often requested ways to access the mailing list configuration variables via external, non-Python systems. But the pickle protocol is entirely Python-specific, so sequestering all that useful data inside a pickle wouldn't work for them. Also, because the entire state of a mailing list was contained in the config.pck, and Mailman has multiple processes that need to read, modify, and write the mailing list state, we had to implement exclusive file-based and NFS-safe locks to ensure data consistency. Every time some part of Mailman wants to change the state of a mailing list, it must acquire the lock, write out the change, then release the lock. Even read operations can require a re-load of the list's config.pck file, since some other process may have changed it before the read operation. This serialization of operations on a mailing list turned out to be horribly slow and inefficient. For these reasons, Mailman 3 stores all of its data in a SQL database. By default SQLite3 is used, though this is easily changed since Mailman 3 uses the Object Relational Mapper called Storm, which supports a wide variety of databases. PostgreSQL support was added with just a few lines of code, and a site administrator can enable it by changing one configuration variable. Another, bigger problem is that in Mailman 2, each mailing list is a silo. Often operations span across many mailing lists, or even all of them. For example, a user might want to temporarily suspend all their subscriptions when they go on vacation. Or a site administrator might want to add some disclaimer to the welcome message of all of the mailing lists on her system. Even the simple matter of figuring out which mailing lists a single address is subscribed to required unpickling the state of every mailing list on the system, since membership information was kept in the config.pck file too. Another problem was that each config.pck file lived in a directory named after the mailing list, but Mailman was originally designed without consideration for virtual domains. This lead to a very unfortunate problem where two mailing lists could not have the same name in different domains. For example, if you owned both the example.com and example.org domains, and you wanted them to act independently and allow for a different support mailing list in each, you cannot do this in Mailman 2, without modifications to the code, a barely supported hook, or conventional workarounds that forced a different list name under the covers, which is the approach used by large sites such as SourceForge. This has been solved in Mailman 3 by changing the way mailing lists are identified, along with moving all the data into a traditional database. The primary key for the mailing list table is the fully qualified list name or as you'd probably recognize it, the posting address. Thus support@example.com and support@example.org are now completely independent rows in the mailing list table, and can easily co-exist in a single Mailman system. Messages flow through the system by way of a set of independent processes called runners. Originally conceived as a way of predictably processing all the queued message files found in a particular directory, there are now a few runners which are simply independent, long-running processes that perform a specific task and are managed by a master process; more on that later. When a runner does manage files in a directory, it is called a queue runner. Mailman is religiously single-threaded, even though there is significant parallelism to exploit. For example, Mailman can accept messages from the mail server at the same time it's sending messages out to recipients, or processing bounces, or archiving a message. Parallelism in Mailman is achieved through the use of multiple processes, in the form of these runners. For example, there is an incoming queue runner with the sole job of accepting (or rejecting) messages from the upstream mail server. There is an outgoing queue runner with the sole job of communicating with the upstream mail server over SMTP in order to send messages out to the final recipients. There's an archiver queue runner, a bounce processing queue runner, a queue runner for forwarding messages to an NNTP server, a runner for composing digests, and several others. Runners which don't manage a queue include a Local Mail Transfer Protocol server and an administrative HTTP server. Each queue runner is responsible for a single directory, i.e., its queue. While the typical Mailman system can perform perfectly well with a single process per queue, we use a clever algorithm for allowing parallelism within a single queue directory, without requiring any kind of cooperation or locking. The secret is in the way we name the files within the queue directory. As mentioned above, every message that flows through the system is also accompanied by a metadata dictionary that accumulates state and allows independent components of Mailman to communicate with each other. Python's pickle library is able to serialize and deserialize multiple objects to a single file, so we can pickle both the message object tree and metadata dictionary into one file. There is a core Mailman class called Switchboard which provides an interface for enqueuing (i.e., writing) and dequeuing (i.e., reading) the message object tree and metadata dictionary to files in a specific queue directory. Every queue directory has at least one switchboard instance, and every queue runner instance has exactly one switchboard. Pickle files all end in the .pck suffix, though you may also see .bak, .tmp, and .psv files in a queue. These are used to ensure the two sacrosanct tenets of Mailman: no file should ever get lost, and no message should ever be delivered more than once. But things usually work properly and these files can be pretty rare. As indicated, for really busy sites Mailman supports running more than one runner process per queue directory, completely in parallel, with no communication between them or locking necessary to process the files. It does this by naming the pickle files with a SHA1 hash, and then allowing a single queue runner to manage just a slice of the hash space. So if a site wants to run two runners on the bounces queue, one would process files from the top half of the hash space, and the other would process files from the bottom half of the hash space. The hashes are calculated using the contents of the pickled message object tree, the name of the mailing list that the message is destined for, and a time stamp. The SHA1 hashes are effectively random, and thus on average a two-runner queue directory will have about equal amounts of work per process. And because the hash space can be statically divided, these processes can operate on the same queue directory with no interference or communication necessary. There's an interesting limitation to this algorithm. Since the splitting algorithm allots one or more bits of the hash to each space, the number of runners per queue directory must be a power of 2. This means there can be 1, 2, 4, or 8 runner processes per queue, but not, for example, 5. In practice this has never been a problem, since few sites will ever need more than 4 processes to handle their load. There's another side effect of this algorithm that did cause problems during the early design of this system. Despite the unpredictability of email delivery in general, the best user experience is provided by processing the queue files in FIFO order, so that replies to a mailing list get sent out in roughly chronological order. Not making a best effort attempt at doing so can cause confusion for members. But using SHA1 hashes as file names obliterates any timestamps, and for performance reasons stat() calls on queue files, or unpickling the contents (e.g., to read a time stamp in the metadata) should be avoided. Mailman's solution was to extend the file naming algorithm to include a time stamp prefix, as the number of seconds since the epoch (e.g., <timestamp>+<sha1hash>.pck). Each loop through the queue runner starts by doing an os.listdir(), which returns all the files in the queue directory. Then for each file, it splits the file name and ignores any file names where the SHA1 hash doesn't match its slice of responsibility. The runner then sorts the remaining files based on the timestamp part of the file name. It's true that with multiple queue runners each managing different slices of the hash space, this could lead to ordering problems between the parallel runners, but in practice, the timestamp ordering is enough to preserve end-user perception of best-effort sequential delivery. In practice this has worked extremely well for at least a decade, with only the occasional minor bug fix or elaboration to handle obscure corner cases and failure modes. It's one of the most stable parts of Mailman and was largely ported untouched from Mailman 2 to Mailman 3. With all these runner processes, Mailman needed a simple way to start and stop them consistently; thus the master watcher process was born. It must be able to handle both queue runners and runners which do not manage a queue. For example, in Mailman 3, we accept messages from the incoming upstream mail server via LMTP, which is a protocol similar to SMTP, but which operates only for local delivery and thus can be much simpler as it doesn't need to deal with the vagaries of delivering mail over an unpredictable Internet. The LMTP runner simply listens on a port, waiting for its upstream mail server to connect and send it a byte stream. It then parses this byte stream into a message object tree, creates an initial metadata dictionary, and enqueues this into a processing queue directory. Mailman also has a runner that listens on another port and processes REST requests over HTTP. This process doesn't handle queue files at all. A typical running Mailman system might have eight or ten processes, and they all need to be stopped and started appropriately and conveniently. They can also crash occasionally; for example, when a bug in Mailman causes an unexpected exception to occur. When this happens, the message being delivered is shunted to a holding area, with the state of the system at the time of the exception preserved in the message metadata. This ensures that an uncaught exception does not cause multiple deliveries of the message. In theory, the Mailman site administrator could fix the problem, and then unshunt the offending messages for redelivery, picking up where it left off. After shunting the problematic message, the master restarts the crashed queue runner, which begins processing the remaining messages in its queue. When the master watcher starts, it looks in a configuration file to determine how many and which types of child runners to start. For the LMTP and REST runners, there is usually a single process. For the queue runners, as mentioned above, there can be a power-of-2 number of parallel processes. The master fork()s and exec()s all the runner processes based on the configuration file, passing in the appropriate command line arguments to each (e.g., to tell the subprocess which slice of the hash space to look at). Then the master basically sits in an infinite loop, blocking until one of its child processes exits. It keeps track of the process ID for each child, along with a count of the number of times the child has been restarted. This count prevents a catastrophic bug from causing a cascade of unstoppable restarts. There's a configuration variable which specifies how many restarts are allowed, after which an error is logged and the runner is not restarted. SIGTERM: intentionally stop the subprocess. It is not restarted. SIGTERM is what init will kill the process with when changing run levels, and it's also the signal that Mailman itself uses to stop the subprocess. SIGINT: also used to intentionally stop the subprocess, it's the signal that occurs when control-C is used in a shell. The runner is not restarted. SIGHUP: tells the process to close and reopen its log files, but to keep running. This is used when rotating log files. SIGUSR1: initially stop the subprocess, but allow the master to restart the process. This is used in the restart command of init scripts. The master also responds to all four of these signals, but it doesn't do much more than forward them to all its subprocesses. So if you sent SIGTERM to the master, all the subprocesses would get SIGTERM'd and exit. The master would know that the subprocess exited because of SIGTERM and it would know that this was an intentional stoppage, so it would not restart the runner. To ensure that only one master is running at any time, it acquires a lock with a lifetime of about a day and a half. The master installs a SIGALRM handler, which wakes the master up once per day so that it can refresh the lock. Because the lock's lifetime is longer than the wake up interval, the lock should never time out or be broken while Mailman is running, unless of course the system crashes or the master is killed with an uncatchable signal. In those cases, the command line interface to the master process provides an option to override a stale lock. This leads to the last bit of the master watcher story, the command line interface to it. The actual master script takes very few command line options. Both it and the queue runner scripts are intentionally kept simple. This wasn't the case in Mailman 2, where the master script was fairly complex and tried to do too much, which made it more difficult to understand and debug. In Mailman 3, the real command line interface for the master process is in the bin/mailman script, a kind of meta-script that contains a number of subcommands, in a style made popular by programs like Subversion. This reduces the number of programs that need to be installed on your shell's PATH. bin/mailman has subcommands to start, stop, and restart the master, as well as all the subprocesses, and also to cause all the log files to be reopened. The start subcommand fork()s and exec()s the master process, while the others simply send the appropriate signal to the master, which then propagates it to its subprocesses as described above. This improved separation of responsibility make it much easier to understand each individual piece. A message accepted for posting would be copied to the archiver queue at some point, so that its queue runner would add the message to the archive. A copy of the message eventually had to end up in the outgoing queue so that it could be delivered to the upstream mail server, which has the ultimate responsibility of delivery to a list member. A copy of the message had to get put into a digest for people who wanted only occasional, regular traffic from the list, rather than an individual message whenever someone sent it. The pipeline-of-handlers architecture proved to be quite powerful. It provided an easy way that people could extend and modify Mailman to do custom operations. The interface for a handler was fairly straightforward, and it was a simple matter to implement a new handler, ensuring it got added to the right pipeline in the right location to accomplish the custom operation. One problem with this was that mixing moderation and modification in the same pipeline became problematic. The handlers had to be sequenced in the pipeline just so, or unpredictable or undesirable things would happen. For example, if the handler that added the RFC 2369 List-* headers came after the handler to copy the message to the digest collator, then folks receiving digests would get incorrect copies of the list posts. In different cases, it might be beneficial to moderate the message before or after modifying it. In Mailman 3, the moderation and modification operations have been split into separate subsystems for better control over the sequencing. 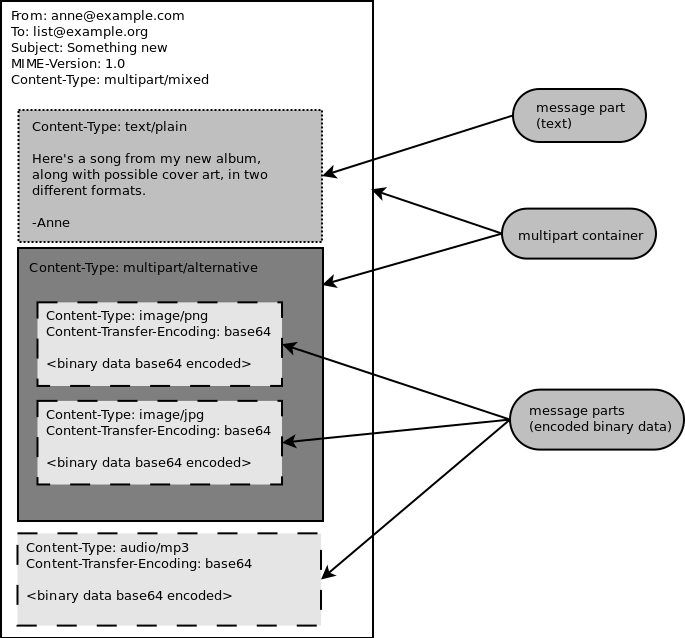 As described previously, the LMTP runner parses an incoming byte stream into a message object tree and creates an initial metadata dictionary for the message. It then enqueues these to one or another queue directory. Some messages may be email commands (e.g., to join or leave a mailing list, to get automated help, etc.) which are handled by a separate queue. Most messages are postings to the mailing list, and these get put in the incoming queue. The incoming queue runner processes each message sequentially through a chain consisting of any number of links. There is a built-in chain that most mailing lists use, but even this is configurable. Figure 10.3 illustrates the default set of chains in the Mailman 3 system. Each link in the chain is illustrated by a rounded rectangle. The built-in chain is where the initial rules of moderation are applied to the incoming message, and in this chain, each link is associated with a rule. Rules are simply pieces of code that get passed the three typical parameters: the mailing list, the message object tree, and the metadata dictionary. Rules are not supposed to modify the message; they just make a binary decision and return a Boolean answering the question, "Did the rule match or not?". Rules can also record information in the metadata dictionary. In the figure, solid arrows indicates message flow when the rule matches, while dotted arrows indicate message flow when the rule does not match. The outcome of each rule is recorded in the metadata dictionary so that later on, Mailman will know (and be able to report) exactly which rules matched and which ones missed. The dashed arrows indication transitions which are taken unconditionally, regardless of whether the rule matches or not. It's important to note that the rules themselves do not dispatch based on outcome. In the built-in chain, each link is associated with an action which is performed when the rule matches. So for example, when the "loop" rule matches (meaning, the mailing list has seen this message before), the message is immediate handed off to the "discard" chain, which throws the message away after some bookkeeping. If the "loop" rule does not match, the next link in the chain will process the message. In Figure 10.3, the links associated with "administrivia", "max-size", and "truth" rules have no binary decision. In case of the first two, this is because their action is deferred, so they simply record the match outcome and processing continues to the next link. The "any" rule then matches if any previous rule matches. This way, Mailman can report on all the reasons why a message is not allowed to be posted, instead of just the first reason. There are several more such rules not illustrated here for simplicity. The "truth" rule is a bit different. It's always associated with the last link in the chain, and it always matches. With the combination of the penultimate "any" rule sweeping aside all previously matching messages, the last link then knows that any message making it this far is allowed to be posted to the mailing list, so it unconditionally moves the message to the "accept" chain. 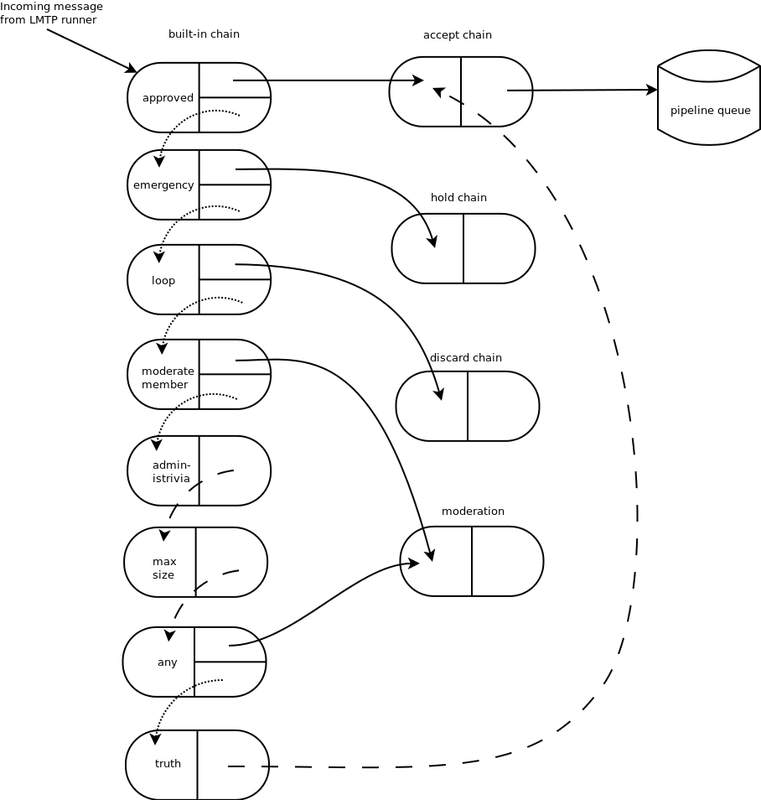 There are a few other details of chain processing not described here, but the architecture is very flexible and extensible so that just about any type of message processing can be implemented, and sites can customize and extend rules, links, and chains. What happens to the message when it hits the "accept" chain? The message, which is now deemed appropriate for the mailing list, is sent off to the pipeline queue for some modifications before it is delivered to the end recipients. This process is described in more detail in the following section. The "hold" chain puts the message into a special bucket for the human moderator to review. The "moderation" chain does a little additional processing to decide whether the message should be accepted, held for moderator approval, discarded, or rejected. In order to reduce clutter in the diagram, the "reject" chain, which is used to bounce messages back to the original sender, is not illustrated. Once a message has made its way through the chains and rules and is accepted for posting, the message must be further processed before it can be delivered to the final recipients. For example, some headers may get added or deleted, and some messages may get some extra decorations that provide important disclaimers or information, such as how to leave the mailing list. These modifications are performed by a pipeline which contains a sequence of handlers. In a manner similar to chains and rules, pipelines and handlers are extensible, but there are a number of built-in pipelines for the common cases. Handlers have a similar interface as rules, accepting a mailing list, message object, and metadata dictionary. However, unlike rules, handlers can and do modify the message. Figure 10.4 illustrates the default pipeline and set of handlers (some handlers are omitted for simplicity). For example, a posted message needs to have a Precedence: header added, which tells other automated software that this message came from a mailing list. This header is a de facto standard to prevent vacation programs from responding back to the mailing list. Adding this header (among other header modifications) is done by the "add headers" handler. Unlike rules, handler order generally doesn't matter, and messages always flow through all handlers in the pipeline. Some handlers send copies of the message to other queues. As shown in Figure 10.4, there is a handler that makes a copy of the message for folks who want to receive digests. Copies are also sent to the archive queue for eventual delivery to the mailing list archives. Finally, the message is copied to the outgoing queue for final delivery to the mailing list's members. VERP stands for Variable Envelope Return Path, and it is a well-known technique that mailing lists use to unambiguously determine bouncing recipient addresses. When an address on a mailing list is no longer active, the recipient's mail server will send a notification back to the sender. In the case of a mailing list, you want this bounce to go back to the mailing list, not to the original author of the message; the author can't do anything about the bounce, and worse, sending the bounce back to the author can leak information about who is subscribed to the mailing list. When the mailing list gets the bounce, however, it can do something useful, such as disable the bouncing address or remove it from the list's membership. There are two general problems with this. First, even though there is a standard format for these bounces (called delivery status notifications, many deployed mail servers do not conform to it. Instead, the body of their bounce messages can contain just about any amount of difficult-to-machine-parse gobbledygook, which makes automated parsing difficult. In fact, Mailman uses a library that contains dozens of bounce format heuristics, all of which have been seen in the wild during the 15 years of Mailman's existence. Second, imagine the situation where a member of a mailing list has several forwards. She might be subscribed to the list with her anne@example.com address, but this might forward to person@example.org, which might further forward the message to me@example.net. When the final destination server at example.net receives the message, it will usually just send a bounce saying that me@example.net is no longer valid. But the Mailman server that sent the message only knows the member as anne@example.com, so a bounce flagging me@example.net will not contain a subscribed address, and Mailman will ignore it. Along comes VERP, which exploits a requirement of the fundamental SMTP protocol to provide unambiguous bounce detection, by returning such bounce messages to the envelope sender. This is not the From: field in the message body, but in fact the MAIL FROM value set during the SMTP dialog. This is preserved along the delivery route, and the ultimate receiving mail server is required, by the standards, to send the bounces to this address. Mailman uses this fact to encode the original recipient email address into the MAIL FROM value. Here, the + is a local address separator, which is a format supported by most modern mail servers. So when the bounce comes back, it will actually be delivered to mylist-bounce@example.com but with the To: header still set to VERP-encoded recipient address. Mailman can then parse this To: header to decode the original recipient as anne@example.com. While VERP is an extremely powerful tool for culling bad addresses from the mailing list, it does have one potentially important disadvantage. Using VERP requires that Mailman send out exactly one copy of the message per recipient. Without VERP, Mailman can bundle up identical copies of an outgoing message for multiple recipients, thus reducing overall bandwidth and processing time. But VERP requires a unique MAIL FROM for each recipient, and the only way to do that is to send a unique copy of the message. Generally this is an acceptable trade-off, and in fact, once these individualized messages are being sent for VERP anyway, there are a lot of useful things Mailman can also do. For example, it can embed a URL in the footer of the message customized for each recipient which gives them a direct link to unsubscribe from the list. You could even imagine various types of mail-merge operations for customizing the body of the message for each individual recipient. One of the key architectural changes in Mailman 3 addresses a common request over the years: to allow Mailman to be more easily integrated with external systems. When I was hired by Canonical, the corporate sponsor of the Ubuntu project, in 2007 my job was originally to add mailing lists to Launchpad, a collaboration and hosting platform for software projects. I knew that Mailman 2 could do the job, but there was a requirement to use Launchpad's web user interface instead of Mailman's default user interface. Since Launchpad mailing lists were almost always going to be discussion lists, we wanted very little variability in the way they operated. List administrators would not need the plethora of options available in the typical Mailman site, and what few options they would need would be exposed through the Launchpad web user interface. At the time, Launchpad was not free software (this changed in 2009), so we had to design the integration in such a way that Mailman 2's GPLv2 code could not infect Launchpad. This led to a number of architectural decisions during that integration design that were quite tricky and somewhat inefficient. Because Launchpad is now free software licensed under the AGPLv3, these hacks wouldn't be necessary today, but having to do it this way did provide some very valuable lessons on how a web-user-interface-less Mailman could be integrated with external systems. The vision that emerged was of a core engine that implemented mailing list operations efficiently and reliably, and that could be managed by any kind of web front-end, including ones written in Zope, Django, or PHP, or with no web user interface at all. There were a number of technologies at the time that would allow this, and in fact Mailman's integration with Launchpad is based on XMLRPC. But XMLRPC has a number of problems that make it a less-than-ideal protocol. Mailman 3 has adopted the Representational State Transfer (REST) model for external administrative control. REST is based on HTTP, and Mailman's default object representation is JSON. These protocols are ubiquitous and well-supported in a large variety of programming languages and environments, making it fairly easy to integrate Mailman with third party systems. REST was the perfect fit for Mailman 3, and now much of its functionality is exposed through a REST API. This is a powerful paradigm that more applications should adopt: deliver a core engine that implements its basic functionality well, exposing a REST API to query and control it. The REST API provides yet another way of integrating with Mailman, the others being utilizing the command line interface, and writing Python code to access the internal API. This architecture is extremely flexible and can be used and integrated in ways that are beyond the initial vision of the system designers. Not only does this design allow for much greater choices for deployment, but it even allowed the official components of the system to be designed and implemented independently. For example, the new official web user interface for Mailman 3 is technically a separate project with its own code base, driven primarily by experienced web designers. These outstanding developers are empowered to make decisions, create designs, and execute implementations without the core engine development being a bottleneck. The web user interface work feeds back into the core engine implementation by requesting additional functionality, exposed through the REST API, but they needn't wait for it, since they can mock up the server side on their end and continue experimenting and developing the web user interface while the core engine catches up. We plan to use the REST API for many more things, including allowing the scripting of common operations and integration with IMAP or NNTP servers for alternative access to the archives. GNU Mailman was one of the first Python programs to embrace internationalization. Of course, because Mailman does not usually modify the contents of email messages posted through it, those messages can be in any language of the original author's choosing. However, when interacting directly with Mailman, either through the web interface or via email commands, users would prefer to use their own natural language. Mailman pioneered many of the internationalization technologies used in the Python world, but it is actually much more complex than most applications. In a typical desktop environment, the natural language is chosen when the user logs in, and remains static throughout the desktop session. However, Mailman is a server application, so it must be able to handle dozens of languages, separate from the language of the system on which it runs. In fact, Mailman must somehow determine the language context that a response is to be returned under, and translate its text to that language. Sometimes a response may even involve multiple languages; for example, if a bounce message from a Japanese user is to be forwarded to list administrators who speak German, Italian, and Catalan. Again, Mailman pioneered some key Python technologies to handle complex language contexts such as these. It utilizes a library that manages a stack of languages which can be pushed onto and popped from as the context changes, even within the processing of a single message. It also implements an elaborate scheme for customizing its response templates based on site preferences, list owner preferences, and language choice. For example, if a list owner wants to customize a response template for one of her lists, but only for Japanese users, she would place the specific template in the appropriate place on the file system, and this would override more generic defaults. While this article has provided an overview of Mailman 3's architecture and insight into how that architecture has evolved over the 15 years of its existence (through three major rewrites), there are lots of other interesting architectural decisions in Mailman which I can't cover. These include the configuration subsystem, the testing infrastructure, the database layer, the programmatic use of formal interfaces, archiving, mailing list styles, the email commands and command-line interface, and integration with the outgoing mail server. Contact us on the mailman-developers mailing list if you're interested in more details. Here are some lessons we've learned while rewriting a popular, established, and stable piece of the open source ecosystem. Use test driven development (TDD). There really is no other way! Mailman 2 largely lacks an automated test suite, and while it's true that not all of the Mailman 3 code base is covered by its test suite, most of it is, and all new code is required to be accompanied by tests, using either unittests or doctests. Doing TDD is the only way to gain the confidence that the changes you make today do not introduce regressions in existing code. Yes, TDD can sometimes take longer, but think of it as an investment in the future quality of your code. In that way, not having a good test suite means you're just wasting your time. Remember the mantra: untested code is broken code. Get your bytes/strings story straight from the beginning. In Python 3, a sharp distinction is made between Unicode text strings and byte arrays, which, while initially painful, is a huge benefit to writing correct code. Python 2 blurred this line by having both Unicode and 8-bit ASCII strings, with some automated coercions between them. While appearing to be a useful convenience, problems with this fuzzy line are the number one cause of bugs in Mailman 2. This is not helped by the fact that email is notoriously difficult to classify into strings and bytes. Technically, the on-the-wire representation of an email is as a sequence of bytes, but these bytes are almost always ASCII, and there is a strong temptation to manipulate message components as text. The email standards themselves describe how human-readable, non-ASCII text can be safely encoded, so even things like finding a Re: prefix in a Subject: header will be text operations, not byte operations. Mailman's principle is to convert all incoming data from bytes to Unicode as early as possible, deal with the text as Unicode internally, and only convert it back to bytes on the way out. It's critical to be crystal clear from the start when you're dealing with bytes and when you're dealing with text, since it's very difficult to retrofit this fundamental model shift later. Internationalize your application from the start. Do you want your application to be used only by the minority of the world that speaks English? Think about how many fantastic users this ignores! It's not hard to set up internationalization, and there are lots of good tools for making this easy, many of which were pioneered in Mailman. Don't worry about the translations to start with; if your application is accessible to the world's wealth of languages, you will have volunteer translators knocking down your door to help. GNU Mailman is a vibrant project with a healthy user base, and lots of opportunities for contributions. Here are some resources you can use if you think you'd like to help us out, which I hope you do! While this chapter was being written, we learned with sadness of the passing of Tokio Kikuchi (http://wiki.list.org/display/COM/TokioKikuchi), a Japanese professor who contributed heavily to Mailman, and was especially knowledgeable about internationalization and the idiosyncrasies of Japanese mail user agents. He will be greatly missed.